Magento Marketplace Table Rate Shipping : Table Rate Shipping is a Marketplace Add-on for Magento. It allows the sellers to create custom shipping methods for their customers. From the frontend, the sellers can either upload a CSV file or enter the shipping details-region, zip code, price, weight directly. The admin and the sellers can also create the super shipping set to further customize shipping method. This module is useful for order confirmation, tracking number from seller and print invoice & shipment slip. The shipping rates are calculated using seller origin address, delivery zip code, product weight, state, region, country. Magento2 Marketplace Table Rate Shipping is also available now. Magento Marketplace Table Rate Shipping - Table Rate Shipping is a Marketplace Add-on for Magento. It allows the sellers to create custom shipping methods for their customers. From the frontend, the sellers can either upload a CSV file or enter the shipping details-region, zip code, price, weight directly. The admin and the sellers can also create the super shipping set to further customize the shipping method. This module is useful for order confirmation, tracking number from seller and print invoice & shipment slip. The shipping rates are calculated using seller origin address, delivery zip code, product weight, state, region, country. Please Note: – Table Rate Shipping is a Marketplace Add-on. You need to install Magento Multi-Vendor Marketplace Extension first. This module supports alpha-numeric zipcodes. The shipping rates are calculated using seller origin address, delivery zip code, product weight, state, region, country. The sellers can easily add shipping rates using CSV import for table rates. The admin and the sellers can also create the super shipping set to customize shipping. The sellers can add shipping rates using CSV import for table rates. The sellers can create custom shipping methods from the front-end. The admin can also upload a shipping CSV file for the sellers. Option to export a shipping CSV file from the back-end. The shipping will be calculated based on zip code and weight. Table Rate Shipping module supports alpha-numeric zip codes. Table rate shipping is an integral part of Magento shipping management but when you are using Magento marketplace module and as a store admin if you want to add the very same option for seller/vendor its hard to implement so thats why we create this addon by which seller can also add table rate shipping management. Shipping is an integral and a must-have feature for any e-commerce marketplace, table rate shipping give seller tons of options from managing order to invoice generation. The vendor will be able to ship the order by adding a tracking id, which will be viewed by the buyer as well. Magento Marketplace Table Rate Shipping add-on allows the seller to define shipping/fright price as per their need. Shipping/fright price is calculated based on CSV entered by seller and shipping cost is calculated based on weight, postal code, region, country, state, and many more options. Allow enable/disable this add-on from the back-end. Add, edit or delete super shipping sets for sellers. Apply admin shipping rates, if seller rates not available. Admin can approve any order. Under the “manage shipping”, the seller will upload the CSV file containing “country code”, “zip from”, “zip to”, “price”, “weight from”, “weight to” and many more. After the order is placed, the seller can go to “my product list” and view the “quantity sold” for that particular order. On clicking on the “quantity sold” number, the seller can see the product with “invoice” option. The seller can upload the table tax rate via a CSV file. Add custom shipping methods without using CSV. Add, edit or delete super shipping sets. Multi-Checkbox Option can be used to delete single/multiple shipping rates. The shipping price is calculated based on CSV entered by seller and shipping cost is calculated based on weight, postal code, region, country, state, and many more options. Buyer will have this shipping method on the check out page if the buyer's shipping address matches the CSV ( zip code, country, weight). Buyer can see selected shipping method under Order Review. If Buyer uses Custom shipping method for order delivery then the shipping rates will be calculated according to product weight and buyer shipping address. After the approval of the order, the seller can generate the invoice. After generating an invoice, the seller can set the tracking number, shipping details and save it. Now the order status will be “complete”. The seller can download the invoice slip and shipping slip for that particular order and can even print both the slips. Even the seller can download the bulk invoice and shipping slips. Did you buy Magento Marketplace Table Rate Shipping? I had to work intensively with the dev team. As One of our customers requested a lot of changes on the MarketPlace extensions. The development of the extension based on our requests have always been met and delivered on time. It is a quality I like about the developers. Our account manager was also an excellent interface to translate our requirements into technical solutions. In the end the customer was satisfied. The support is very good. They provided all the information that i requirement that i required. They supported a lot while am facing any issues. Can seller create their own shipping methods? Yes, the seller can create their own shipping methods and can display them to the customers during the checkout. What happens if seller rates are not available? If the seller rates are not available for shipping method, in this case, the admin can set the settings to allow admin's rate or can display an error message. 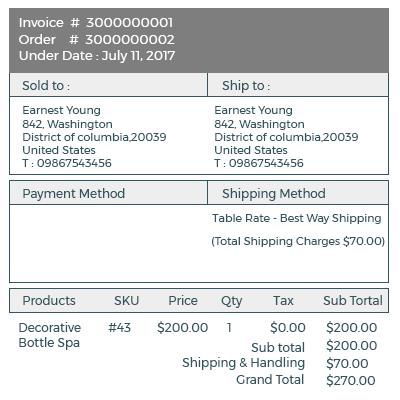 Can the admin upload Table Rate Shipping CSV on behalf of the seller? Yes, the admin can easily upload the Table rate Shipping CSV for the marketplace sellers. This can be done under Mpshipping Manager settings under Marketplace Management. Can the seller manage the order? Yes, the seller can manage the customer order. Only if admin sets the “Allow Seller to Manage Order” option as “yes”. Can the seller download multiple invoice slips & shipping slips? Yes under My order history option & after clicking on download option, a pop-up window will appear. Here you will enter the date up to which you want to download invoice slip and shipping slip and can click the download button. + Seller and admin can add sub-methods. + Seller and admin can create superset for free shipping rate and fixed shipping rate. + Admin can add shipping rates for sellers also. + Admin can select to apply and not to apply admin rates if no rate available for seller. + Seller can delete multiple shippings from their panel. + Compatible with alphanumeric zip code. + Translation csv content added. + Seller can add shipping rates using CSV import for table rates. + Shipping will be calculated based on ZIP and weight. + Seller can confirm the order and can set the tracking ID for the order. + Shipping rates will populate based on CSV during checkout. + Ability to download Invoice & Shipping slip easily.